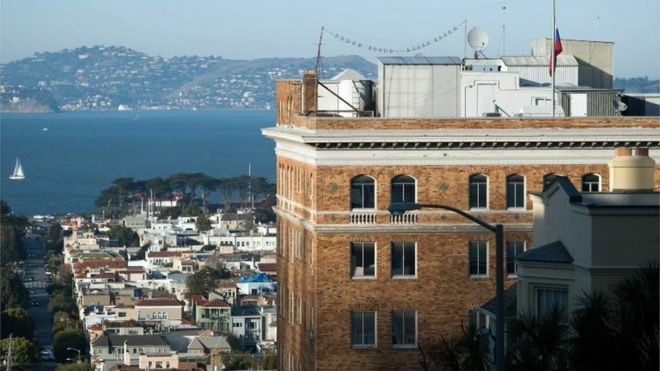 Russian San Francisco consulate will close tomorrow. A Consulate General in San Francisco, a chancery annex in Washington, D.C., and a consular annex in New York City are being closed as of tomorrow. This leaves 3 consulates for each country, this limited measure achieves parity in the number of consulates for each country. Russia should not complain, all this does is put both the US and Russia on equal footing. There is no overreaction and no inequities. What should be interesting is Russia’s response. Newly-appointed Russian Ambassador to the United States Anatoly Antonov arrived in Washington DC this morning. Talk about a tough first day on the job. Russian Foreign Minister Sergei Lavrov does not see this as parity, instead calling it an escalation. It seems Russia does not understand the concept of equality, it’s all about flat out winning, it seems. This latest move deeply hurts Russia deeply as they desperately need to build trade to help their economy.